The southern neighbor of the United States of America faces a transition of its executive power in less than one hundred days. 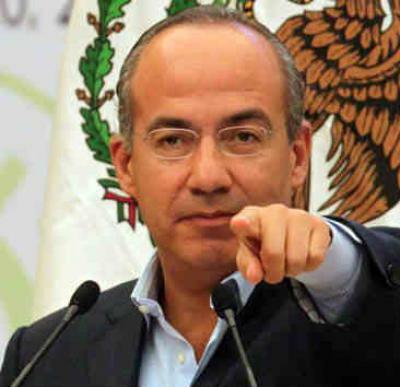 The inauguration of Enrique Peña Nieto of Partido Revolucionario Institucional or the Institutional Revolutionary Party (PRI) will take place on December 1 and Felipe Calderón from Partido Acción Nacional or National Action Party (PAN) will cease to be the president of Mexico. The change goes beyond a simple switch of names and men in position: it is a debate of continuity, as well as the nature of security and economic policies under Calderón. In the meantime, a large number of PRI’s deputies and senators have taken their seats in the Congress and the Senate of Mexico, leaving Calderón’s PAN party with less influence than ever in political maneuvers. As the date of Peña Nieto’s inauguration approaches, talks about the presidential transition also have begun. It is the second time that independent Mexico is facing a presidential change from one party to another and the first time the United States’ neighbor will be governed by the PRI again after twelve years of PAN rule. The PRI has governed Mexico for most of the 20th century and during this period serious doubts have been raised about the quality of Mexican democracy and the use of authoritative tactics during its time in power. 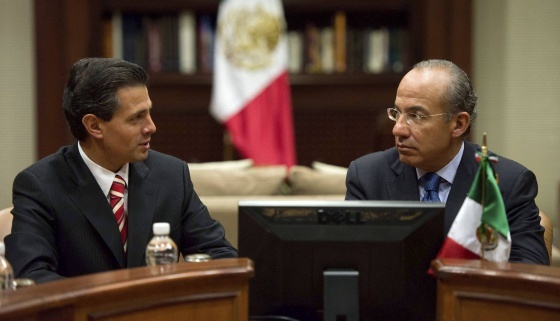 Outgoing president Calderón and his successor had a transitional meeting on September 6 that was followed by a press conference, in which Peña Nieto praised Calderon’s economic policies that have led to the “macroeconomic stability in the country he [Peña Nieto] is inheriting.” Though it is still unknown what direction the future president will take, Calderón has spoken of his strong wish for the continuance of his current security policies and the war against the drug cartels. The stable environment of the current transition agreements is quite different in comparison to what Calderón had to face on his first day upon taking office six years ago. On December 1, 2006, the newly-minted Mexican president experienced difficulties while trying to enter the Legislative Palace of Saint Lazarus in order to accept executive authority from his predecessor, the PAN leader Vicente Fox. Both politicians had to enter through the back of the building, because the defeated candidate of the Democratic Revolution Party, or the PRD, was blocking their entrance in protest of the results of elections. During this transition, a different complication is likely to arise in regards to the electoral results in the Congress of the Deputies and in the Senate, where the PRI was not able to achieve a clear majority given it only took 207 deputy seats. For this reason, if Peña Nieto wishes to be influential in his presidency by enacting new laws, he will have to rely on the political support from the PAN, which has 114 deputies. Making matters more difficult, PRD, the third largest parliamentary power, has 100 deputies and is generally regarded as an impossible candidate to partner with the PRI. The existing antagonism was obvious when the PRD’s leader López Obrador organized various protests in the aftermath of the presidential elections on July 1, eventually culminating in his filing a complaint with the Supreme Court of Mexico. The upcoming months will most likely see Calderón’s presidency push for the most controversial bills. For this reason, in order to ensure the passage of such proposed reforms, Calderón is the first Mexican president to exercise his constitutional right to propose two “preferred initiatives”. Indeed, Article 71 of the Mexican Constitution gives the president the right to propose those initiatives in front of the newly elected Congress. This preferred process obliges the Congress or the Senate, depending where those initiatives originated, to stage a vote on the bill. The main goal of such an initiative is to “avoid blockage within the Congress during its new term,” according to El Universal, Mexican newspaper. During his final two months, Calderón has been forcing the new Congress to reconsider and vote on the bill in a very tight time frame: the Constitution provides only thirty days from the day that the president introduces the bill for the vote to occur. President Calderón has chosen to propose two bills to Congress: a labor reform bill to the Deputies in the Lower Chamber and a bill entitled General Bill of Governmental Accountability to the Senators in the Upper Chamber. The outgoing Calderón’s other bill is the General Bill of Governmental Accountability, to be voted on in the Senate. This bill is not as controversial as the previous one, as it forces municipalities and governors to “present budget information completely, together with the public debt.” It is the first time Mexican local governments will be forced to publicly reveal their complete current financial records. Even though Calderón’s party did not win a majority in the new Congress, Peña Nieto’s PRI failed to obtain a majority as well. It is very likely that mutual cooperation and an unspoken coalition will take place in Congress. The PAN certainly will take advantage of the current political situation, where the left is sharply divided as a result of Obrador’s rejection of the official presidential electoral results, and this center-right party in return will play the role of a vital ally of PRI. Thus, President Calderón’s major goal now is to pass the proposed reforms before his time in office runs out. On the other hand, for Peña Nieto, it is crucial to secure a stable partner in the Congress in order to neutralize the PRD deputies, who retain bitter feelings over the PRI’s presidential triumph. It is all-but-inevitable that this bitterness permeates in the legislature body. Mexican rule’s of the game of “give and take” commenced with the last 100 days of Calderón rule.